RETRO KIMMER'S BLOG: GUITAR WORLD LOVE FOR RON ASHETON! For a guy who's ranked in the top 30 guitarists of all time by Rolling Stone, Ron Asheton managed to stay below the radar for many a rock music fan. Even after he passed away in 2009, Asheton's legacy hovered somewhere between "overrated" and "underrated," though today his impact cannot be overemphasized. In other words, if you've missed out on his incendiary guitar playing — meaning one of Detroit's legendary bands, the Stooges, has escaped your notice — then you've clearly been on another planet. Asheton was the guitar player and a founding member of the Stooges, playing on the classic The Stooges and Fun House albums from the late '60s/early '70s. 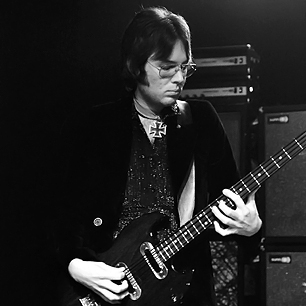 Not a flashy lead guitarist, nor a ham-it-up showoff, Asheton played the guitar matter-of-factly and in your face. His playing relied on fuzzed-out chordal riffs and dissonant, stabbing leads — unlike most of the guitar you heard in 1969. If you went to Detroit’s Grande Ballroom to see the Stooges and were expecting some kind of "Summer of Love" six-string bliss, you were at the wrong venue, man! It was an amazing and very emotional night for all involved and we all hope you will like the result. 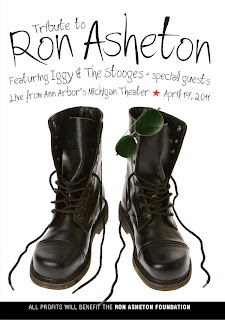 I saw the stooges many times and was always amazed at Rons playing. He burned up the place but most of the time everyone was watching iggy. wondering if he was going to come out into the crowd or how he would get out into the crowd weather it be with a couple of sunfishes first or mayby just a plain old belly smack into the mud like he did at the mt. clemens pop festival so long ago. detroit had it all back then. motown, the five, and great players everywhere.